Over the past four years, approximately 14,000 shipments from all over the world arrived in Alberta, Canada for the construction of a bitumen refinery near the Kearl oil sands. Lynden International, Lynden Canada Co. and Canadian Lynden Transport provided support and logistics to engineering firm AMEC for the refinery project which included 12 Lynden employees in Edmonton and Calgary. “The last four truckloads were delivered in late March, but over the past few years we moved everything from small packages to heaters weighing 150,000 pounds,” says Walter Rakiewich, Canadian Lynden Transport President. The Lynden companies provided international freight forwarding, warehousing, just-in-time shipping and truck transportation from Calgary to the refinery site 70 miles outside Fort McMurray. 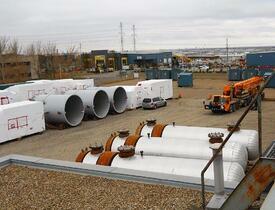 Most of the project was based at the Foster’s Wheeler’s Construction Staging Area (CSA) facility in Northern Alberta. 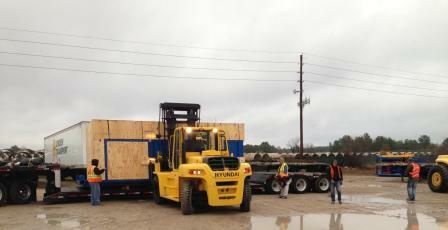 Freight came from all over the world via air, truck, rail and ship, all coordinated by Lynden International. “I’ve never been involved in a project of this complexity and size and it was a great experience. I couldn’t have asked for a better group of employees to work with,” Walter says. The project also affected the Canadian Lynden Transport crew as trucks were needed to haul truckload, less-than-truckload and heavy haul loads. Walter singled out Dispatcher Deanna Benson as key to keeping things running smoothly during the busy project years. Lynden’s adaptability was a huge plus, according to Steve Foster, CSA Manager at Foster Wheeler. “Lynden provided great service to AMEC. Our ability to meet the contractors’ requirements was solely based on the excellent service provided by Lynden personnel at this facility.” He specifically noted Lynden’s ability to mobilize when priorities changed, the availability of trailers and other equipment and the availability of a dedicated driver to assist when the changes hit. In 2014, Lynden was selected from all of AMEC’s global business units as a recipient of the Beyond Zero Outstanding Achievement award for working 100,000 hours accident-free. Lynden Administrative Assistant Candice Fox also received an award for exceptional dedication to the CSA team (see photo below). With an established Canadian presence through Lynden Canada Co. and Canadian Lynden Transport, Lynden is ready to continue its support of Canada’s oil industry. “I think we all feel a great sense of accomplishment with the way this project turned out and great pride in our employees who made it a success,” says Randy Jackson, Lynden International Vice President.